BARCELONA, Spain — Hundreds of thousands of people rallied Sunday in downtown Barcelona to protest against the plans of Catalonia's regional government to secede from the rest of Spain. 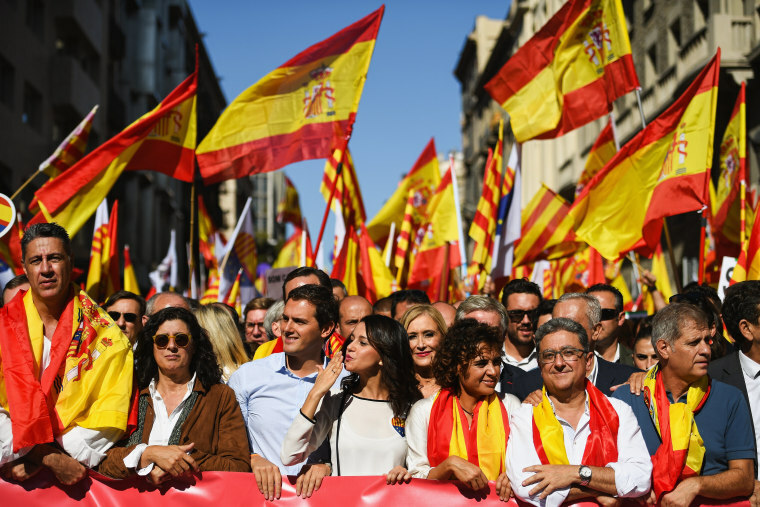 The march was the largest pro-union showing since the rise of separatist sentiment in the prosperous northeastern region that has pushed Spain to the brink of a national crisis. Barcelona police said 350,000 people participated, while march organizers Societat Civil Catalana said that 930,000 people turned out. Those numbers resemble the pro-independence rallies that Barcelona has seen in recent years. Many in the crowd who marched through the city center under the slogan of "Let's recover our common sense!" carried Spanish, Catalan and European Union flags. Some chanted "Don't be fooled, Catalonia is Spain" and called for Catalan president Carles Puigdemont to go to prison. Sunday's rally comes a week after the Catalan government went ahead and held a referendum on secession that Spain's top court had suspended and the Spanish government said was illegal. Catalan authorities say the "Yes" side won the referendum with 90 percent of the vote, though only 43 percent of the region's 5.3 million eligible voters turned out in polling that was marred by police raids of polling stations on orders to confiscate ballot boxes. Puigdemont has pledged to push ahead for independence anyway and is set to address the regional parliament on Tuesday "to report on the current political situation." Spanish Prime Minister Mariano Rajoy vows that his government will not allow Catalonia, which represents a fifth of Spain's economy, to break away from the rest of the country. In an interview with the Spanish newspaper El Pais published Sunday, Rajoy said that he will consider employing any measure "allowed by the law" to stop the region's separatists. Rajoy said that includes the application of Article 155 of the Spanish Constitution, which would allow the central government to take control of the governance of a region "if the regional government does not comply with the obligations of the Constitution." "The ideal situation would be that I don't have to find drastic solutions, but for that to happen there will have to be some rectifications (by Catalan leaders)," Rajoy said. Rallies were held Saturday in Madrid, Barcelona and other cities to demand that Rajoy and Puigdemont negotiate to find a solution to Spain's worst political crisis in nearly four decades. Pro-union forces hope to gather steam with Sunday's protest in Barcelona after a series of large businesses, including Catalonia's top two banks, announced they were relocating their headquarters to other parts of Spain. Other companies are reportedly considering leaving Catalonia to avoid being cast out of the European Union and its common market in the case of secession. "I hope that nothing will happen. Because (Catalonia) is going to lose more than (Spain) because businesses are fleeing from here already," said protestor Juliana Prats, a Barcelona resident. "I hope it will remain like it has been up until now, 40 years of peace." The rally drew Spaniards from outside the northeastern region to the Catalan capital. One group held a large banner boasting "Marbella," a town on Spain's southern coast. An AP reporter spoke with another man who had come from the northern Basque Country region. Nobel Literature Prize laureate Mario Vargas Llosa and former president of the European Parliament Josep Borrell addressed the rally. "Besides Catalans, there are thousands of men and women from all corners of Spain who have come to tell their Catalan companions that they are not alone," said Llosa, who took on Spanish citizenship in addition to that of his native Peru in 1993. "We want Barcelona to once again be the capital of Spanish culture." Borrell added that: "Catalonia is not a state like Kosovo where rights were systematically violated." Rajoy's government has repeatedly refused to grant Catalonia permission to hold a referendum on grounds that it is unconstitutional since it would only poll a portion of Spain's 46 million residents.